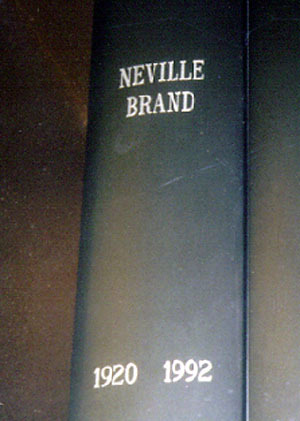 Brand has been credited as the fourth most decorated soldier in World War II, but that claim has never been proven. in the “Big Train” two parter. Brand starred in Laredo from 1965-1967, when he portrayed Reese Bennett. He would appear in many westerns mostly, but also appeared in TV movies, free-lanced as an actor in other television series and acted in movies till 1985, which would be his last appearance on either television or movies. His last movie was Evils of the Night. He was an avid reader and had a huge book collection of over 30,000 books, in his Malibu home, but a fire destroyed most of his book collection, along with other mementoes in 1978. He died at the age of 71 from emphysema on April 16, 1992 in Sacramento, California. His ashes were stored in a vessel shaped like a book that showed the years that he lived. The world lost not only a great actor, but more importantly a World War II hero, when Neville Brand died but his memory will go on due to the the many television shows and movies he appeared in during his lifetime. Little Boy atomic bomb facsimile of the bomb which hit Hiroshima. This is an empty bomb casing of the Mk I or Little Boy series of atomic bombs. 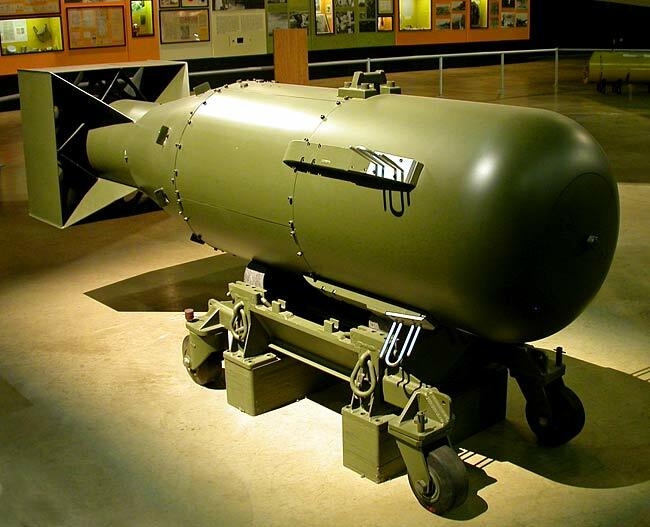 About 5 were produced in the series and when they were deemed obsolete the fissionable Uranium 235 was removed along with the triggering explosives. The casings were then either scrapped or distributed to other museums. The bomb casing pictured above represents the Little Boy atomic bomb, that was delivered by the USS Indianapolis on July 26, 1945. Atomic Bomb Pit #1 and Memorial The No.1 bomb loading pit on Tinian where the atomic bomb, “Little Boy” was stored before being loaded onto the B-29 “Enola Gay” 44-86292. This area was heavily guarded and a tent erected over the bomb before this top-secret weapon was loaded onto the bomber, and was dropped on Hiroshima on August 6, 1945. Today, a single coconut palm and a plumeria tree grow in it. Locals have always observed misshapen coconuts on this tree, normal ones have never been produced on this tree. This hole is probably one of the most historically charged remain of the island’s past. Atomic Bomb Pit #2 Next to it is pit “No.2”, where “Fat Man” atomic bomb was loaded into B-29 “Bockscar” 44-27297 and dropped over Nagasaki. Today, the two concrete lined pits are filled in with dirt. Just four days after the Little Boy atomic bomb was delivered, to the Ushi Point Airfield on the island of Tinian the USS Indianapolis was hit by two Japanese torpedoes, which resulted in the ship sinking, in only 12 minutes and it still has not been found to this day. If the ship had been hit with the atomic bomb aboard it would have almost certainly ended the lives, of every American sailor aboard the ship. The sailors who had to abandon the ship experienced shark attacks, exposure and dehydration before being spotted by a patrol aircraft four days later. One of the sailors who lived through the experience told of seeing his friends eaten by sharks. He said sharks would dive at them and next thing he knew he would only see blood in the water. History could have been changed, if the torpedoes would have hit the USS Indianapolis, before it delivered the atomic bomb to the airfield. 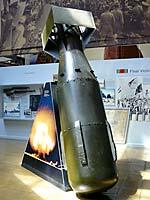 On August 6, 1945 the Little Boy atomic bomb was dropped on the city of Hiroshima. 90,000 – 160,000 were killed by the atomic bomb dropped over Hiroshima. President Truman said later, that we were fortunate that Hitler was unsuccessful in developing an atomic bomb. It will be argued for years, whether it would have been better to fight a ground battle in Japan, which may have taken years or months, or to end the war abruptly with the least loss of American life, by dropping the bombs over Hiroshima and Nagasaki. Vice President Lyndon Baines Johnson was riding in a limousine two cars behind the presidential limousine, in which President John F. Kennedy and his wife Jacqueline were riding. Johnson apparently knew that his limousine was in the killing zone, as he was reportedly ducking down before the first shots were fired. When the first shots hit President Kennedy at 12:30 on November 22, 1963 and resulted in his death about 30 minutes later, then it changed the life of LBJ forever. LBJ would be sworn in at 2:38 PM aboard Air Force One, which was only two hours and eight minutes after the first shot was fired an an hour and 38 minutes after the nation learned that President Kennedy had succumbed to the fatal wounds incurred by an assassin or assassins. If someone asked who would have the most to gain, from the death of JFK the answer would overwhelmingly be LBJ, who went from being a figurehead in the Kennedy administration to being the president of the United States. Another reason LBJ needed to be president on November 22, 1963 was that his name was about to be mentioned,in the Bobby Baker hearings currently going on in Washington that day. Testimony from those hearings would implicate LBJ and expose the fact that he was getting kickbacks, which would be a felony and he would have risked being sent to prison. However, by becoming president the hearings were stopped suddenly and President Johnson’s reputation was not sullied, because he was a sympathetic figure having just assumed the presidency, at a time when the nation was in mourning over the death of their president. President Johnson died 10 years later in 1973 and apparently took his secrets regarding his kickbacks in the Bobby Baker scandal and the Billie Sol Estes scandal and his alleged part in the assassination planning to his grave. This is my opinion for what it is worth as to who masterminded the assassination of President Kennedy on that November day 50 years ago: Lyndon Baines Johnson was very unhappy being a second banana in the Kennedy administration and he teamed up with the CIA, FBI and the underworld to conspire to kill the president. When President Kennedy fired Allen Dulles the director of the CIA later that year it worsened the relations, between the president and the CIA. FBI director J. Edgar Hoover disliked both President Kennedy and his brother Attorney General Bobby Kennedy. He had secrets about the Kennedy brothers and their womanizing. When Marilyn Monroe threatened to expose their secrets she died a mysterious death in August of 1962. If she had been allowed to tell the media, what she know about the Kennedy brothers, then they both may never have been assassinated, since they would be out of power and cooling their heels at Martha’s Vineyard in Massachusetts, instead of being assassinated in 1963 and 1968. Underworld figures had their own motives to assassinate President Kennedy, since his brother Bobby, in his role as attorney general was waging a war against organized crime, who were the same people, that enabled his brother the president to win the 1960 election, through their dirty politics. If Madeleine Brown was telling the truth, then this is evidence, that LBJ was heavily involved with the assassination. The proponents of the Warren Commission Report may think the mystery,of who assassinated President John F. Kennedy was solved with the release of the Warren Report in 1964, but I still have questions, that I would like to know answers to, before making a decision one way or the other. What part did Lee Harvey Oswald play in the assassination? I am still not sure he was even in the sixth floor sniper’s nest,when the fatal shots were fired. He was seen in the second floor break room 75 seconds,after the shots were fired and was drinking a Coca-Cola. The motorcycle policeman who questioned Oswald said that Oswald was very calm and not out of breath. Not the reaction of someone,who had just shot the president of the United States. I figure that Oswald did bring his rifle to the sixth floor window that day, so naturally had his fingerprints on it and was probably seen by a witness before the shooting. The deal breaker for me was that LBJ’s hitman Mac Wallace had his fingerprint found on a box on the sixth floor. I think Oswald was set up to look like he was the shooter, while Wallace fired the fatal shots, but Wallace was not even on the sixth floor at the time. Why would the Dallas police department send a lone policeman to stop Oswald, knowing he was a suspect in the assassination of the president, instead of having two or three cars at the scene before accosting Oswald? Officer J.D. Tippit may still be alive if this precaution had been taken. Why was Jack Ruby allowed into the Dallas Police Station and why did he gain admittance while carrying a firearm? I can’t help but wonder if Ruby had inside help to gain entrance into the police station, without being searched by someone. Why wasn’t the transfer vehicle already backed into place, which would have likely prevented Ruby from getting an easy shot at Oswald and why wasn’t Oswald moved during the night? Ruby was allegedly told by his crime bosses, to kill Oswald, so their names wouldn’t be mentioned during the interrogation. Why did the Warren Commission single out Oswald as the lone conspirator, when he had a long history of being involved in double agent work? I believed Oswald, when he stated that he was a patsy. The lone conspirator theory may have satisfied some Americans, but there is still an overwhelming majority, that thinks he was only a small part of a huge conspiracy to assassinate President Kennedy. Why wasn’t more attention paid to Rose Cherami when she told authorities in Louisiana, that she was traveling with two men on the way to Dallas to assassinate the president two days before the assassination? If someone had taken her seriously it could have affected the way the motorcade was conducted on November 22. The top would not have been lowered, if the Secret Service knew there was a viable threat that the president might be assassinated. Still wonder why LBJ insisted on the top being down that day according to some reports and why he also insisted that Jackie Kennedy ride with him in his vice presidential limousine. The people along the motorcade route didn’t come to see Jackie Kennedy riding with LBJ. They wanted to see her with her husband the president. Why would a bullet be found on Governor Connally’s stretcher unless it was planted there? The magic bullet theory was crucial to the Warren Commission’s theory that Oswald was the lone gunman. I won’t go into detail, since my knowledge of ballistics is very limited. Why haven’t there been more assassination records released 50 years later? There probably are very few people involved with the assassination still alive. LBJ died 40 years ago. J. Edgar Hoover died 41 years ago. Carlos Marcello, who has been linked with the assassination died 20 years ago. One of the few people still alive today is James Leavelle, who escorted Lee Harvey Oswald on his rendezvous with death, as Jack Ruby ended his life two days after he assassinated the president. Why did presidential limousine driver stop the vehicle after the shooting began? The delay allowed the shooter or shooters more time to fire their next shot. Why was the presidential limousine cleaned before it could be examined, since it was the crime scene of the assassination? Evidently, someone didn’t want to risk an investigator finding evidence, that might not jive with the lone gunman theory. Why did Lee Harvey Oswald work with both anti-Castro and pro-Castro forces? This tells me he was a double agent working for both sides. I think personally, that Oswald was being groomed by the CIA to look like he was a kook, that hated President Kennedy and was good enough of a marksman to assassinate him. Why didn’t Earl Warren agree to Jack Ruby testifying in Washington, when Ruby had told him he would talk in Washington, but not in Dallas? This may be Earl Warren’s way of making sure that Ruby’s testimony wouldn’t ruin the lone gunman theory, that was the cornerstone of the Warren Report. Why did a large number of witnesses or witnesses preparing to testify in JFK assassination die mysterious deaths?The debunkers will say there was nothing unusual about any of the deaths, but a case by case study will show there were many mysterious deaths. The mysterious death of Dorothy Kilgallen came shortly after she said she had information that would blow the JFK assassination case sky-high. She had interviewed Jack Ruby shortly before her death and probably in the process of writing the article about her interview with Ruby. In conclusion….there are many more questions that could be asked about the assassination, but the ones are above are questions that I hope to see answered someday. Nobody on either the conspiracy side or the non-conspiracy side is going to convince me, what the truth is till I know beyond a doubt. what actually happened that day. My best guess right now is that LBJ was the mastermind behind the JFK assassination. Abraham Zapruder was born in Russia in 1905 and didn’t move to the United States, until his family emigrated to Brooklyn, New York in 1920. Zapruder worked his way up in the fashion industry and co-founded Chalet and Jennifer Juniors in Dallas and his office was located in the Dal-Tex building in Dealey Plaza. He had no plans of taking his movie camera, to film the motorcade with President John F. Kennedy on November 22, 1963, but his secretary Lillian Rogers talked him into driving the 14 mile trip home to pick up his camera. If he had left his movie camera at home he would have been just another spectator that day, but having his camera made him an integral part of the events of that day. The movie camera used by Abraham Zapruder to film the assassination of President John F. Kennedy. It is amazing that Zapruder picked the precise best spot, to record the assassination of President Kennedy. He took the film of the assassination, which won’t be shown here because the film is very disturbing. The 18 second film was almost certainly the most important evidence, when determining the sequence of the shots. The movie camera was a 8 mm Bell & Howell Zoomatic Director Series Model 414 PD. Zapruder had his receptionist call the police, since he knew the film contained some very important footage. He later would reportedly sell a copy of the film, to Life Magazine for $150,000. He donated $25,000 of that money to the widow of Officer J.D. Tippit, who was killed less than an hour after the assassination. JAY WATSON (Station WFAA Dallas): […] And would you tell us your story please, sir? ABRAHAM ZAPRUDER: I got out in, uh, about a half-hour earlier to get a good spot to shoot some pictures. And I found a spot, one of these concrete blocks they have down near that park, near the underpass. And I got on top there, there was another girl from my office, she was right behind me. And as I was shooting, as the President was coming down from Houston Street making his turn, it was about a half-way down there, I heard a shot, and he slumped to the side, like this. Then I heard another shot or two, I couldn’t say it was one or two, and I saw his head practically open up [places fingers of right hand to right side of head in a narrow cone, over his right ear], all blood and everything, and I kept on shooting. That’s about all, I’m just sick, I can’t… WATSON: I think that pretty well expresses the entire feelings of the whole world. ZAPRUDER: Terrible, terrible. WATSON: You have the film in your camera, we’ll try to get… ZAPRUDER: Yes, I brought it on the studio, now. WATSON: We’ll try to get that processed and have it as soon as possible. November 22, 1963 was the last time that Zapruder owned or used a camera, probably due to him seeing President Kennedy assassinated through the lens. His appearance before the Warren Commission, since he had to relive what he had seen that 22nd day of November in 1963 was very trying. He lost his composure when recalling the events of that day before the commission. Abraham Zapruder set up his movie camera, in hopes of filming the motorcade of President John. F. Kennedy. But what he saw in his lens was the brutal assassination of President Kennedy. He may have taken the most important home movie ever made. It was less than seven years, after the assassination when Abraham Zapruder succumbed to cancer on August 30, 1970 at the age of 65. Leslie Haskin’s book Escape From the World Trade Center may not be the best book written about 9/11, but her personal account of that day is a gripping one, that most readers will find very informative. The book is available free as of this minute at Amazon for Kindle readers. The 74 page book may be short, but says a lot in those 74 pages. She describes her day from waking up at 5:15 AM to boarding the train for her daily commute, to the terrorizing events of 9/11, to returning home later that day. Lesley Haskin worked in the North Tower, also known as Tower One of the World Trade Center. She got off the elevator on the 36th floor at 8:28 AM and was talking to a co-worker at about 8:43, when the building shook and swayed. Desks and chairs in her office began flying out the window. Leslie who had post traumatic stress was in a state of shock, not grasping the enormity of the situation. She for some reason decided to call a friend, to get an idea of what was happening, but the phone was dead and someone questioned her, as to what she was doing staying in the room and then she joined the rest as they made their long descent to the lobby and hopefully a safe place. Note: Tower 1 construction started in August of 1968 and was completed in December of 1970. It took 12 years to build the North Tower but it collapsed 102 minutes after it started burning. The South Tower collapsed only 56 minutes after being struck. It was a long descent for Leslie as she began moving down the crowded stairway. She saw many horrific sights during her descent. People in flames were also coming down the stairway. She would also see a decapitated body as on her descent. At one point she was hit by a human torso. It was a race against time as the victims continued their descent as they descended the North Tower stairways. One thing that stood out for Leslie was that she saw the look of fear in the eyes of the firemen forcing their way up the stairway, while looking for someone to help. 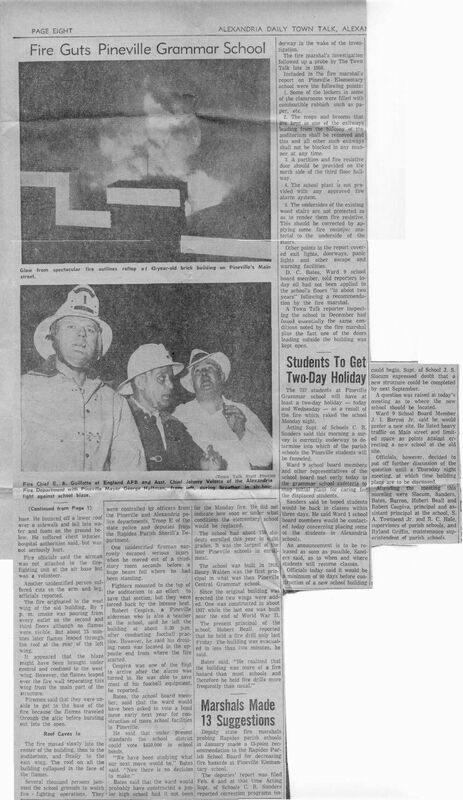 It was sad that many firemen didn’t get the message, to evacuate the North Tower after the South Tower had collapsed. Leslie finally reached the lobby and went outside and for some reason she watched, those who were jumping from the building as they fell to their deaths. The jumpers obviously had to choose their way of death. They had a choice of becoming consumed in flames or jumping to their deaths. Either way meant instant death. Someone finally told her to run to safety, instead of staying so close to the building. She walked to where she could board a boat, that would take her to the train station in Hoboken. Leslie finally arrived at home and it all hit her as she emitted a scream, as she saw relatives and friends, after returning home. What had started out as a typical workday had turned into the most horrific day of her life. Even after reading Escape From World Trade Center we still cannot fully comprehend what Leslie Haskin faced that day 12 years ago, when American soil was attacked by terrorists. We don’t know what it was like to see people on fire, decapitated bodies, people jumping out of buildings to a certain death or to try to flee a building that could collapse at any minute. 9/11 is by far the biggest story since the year 2000 started. The previous big story was when President John Fitzgerald Kennedy was assassinated on the streets of Dallas on November 22, 1963. He and Office J.D. Tippit were the only ones killed that day, but 9/11 affected far many more people personally, as close to 3,000 people lost their lives on September 11, 2001. The terrorists not only ended the lives of those entombed in those planes and buildings that day, but they robbed relatives and friends of those that perished of ever seeing their loved ones again, except in a coffin and some were even robbed of that, since there were no remains found of some victims. Many other American lives have been lost in the years since 9/11, as the United States sent troops to Afghanistan and Iraq. 4,486 military people have met their death in Iraq since 2003. 2,270 more soldiers have died in Afghanistan, for a total of 7,256 military deaths, which means a total of around 10,000 Americans having died during and in the aftermath of the 9/11 attacks. Who knows what building Flight 93 would have hit, if some brave men on that flight hadn’t fought the hijackers, which resulted in the plane crashing in Shamokin, Pennsylvania? We will never know if that plane may have hit the Capitol building or the White House that day. bin Laden may be dead, but that is little consolation for the survivors of the 10,000 dead Americans. Life will never be the same for them, nor will it be the same, for those that were victims of the attacks that day, that saw images of dying people that day and those images will be ingrained in their thoughts for the rest of their lives. Next week will be the 12th remembrance of 9/11. We have been fortunate that there has no been another major attack on American soil by terrorists in the last 12 years. However, we must remain vigilant and aware of any suspicious activity, that we see and notify the authorities, as soon as we notice that activity. We must not forget the firemen and policemen, who paid the ultimate price, for being there to help the victims as they fled the buildings, even though it meant losing their own life. Each of us should stop to remember those firemen and policemen next week, as they stand for everything that is good about America. Entrance to Louisiana College campus in Pineville, Louisiana. I was born in 1944 in West Lafayette, Indiana and moved to Pineville, Louisiana, before my 2nd birthday in 1946, so my dad could teach chemistry at Louisiana College. 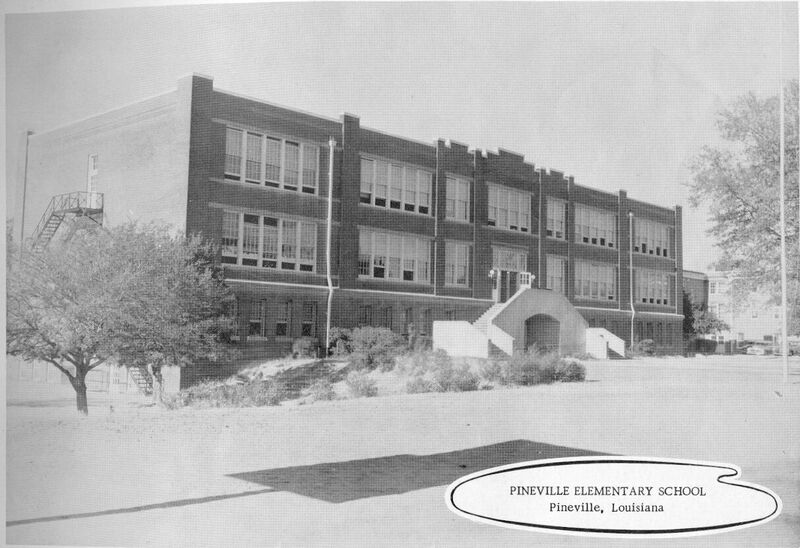 My first memory of Pineville was starting the first grade at Pineville Elementary in 1950 and walking the mile to school. I did ride the bus in the second grade, until the day I didn’t get off, at my stop and wound up in Libuse, Louisiana, which was about a ten-mile walk back home. Needless to say I never rode a bus to school after that incident. The bus driver was Harold Price, who drove a school bus many years. I remember being in the class of Mrs. Eva Price, if I recall her first name right. One of my best friends in first grade was Robert Cavanaugh, who would later run track for Pineville High School and LSU. Then later Dr. Cavanaugh would become the chancellor of LSU in Alexandria and was responsible for it becoming a four-year college. One thing I remember about the first grade is the ten-cent lunches. The price has probably gone up to 15 cents some 63 years later. The second grade through fourth grade years sort of ran together, with no standout memories from those years. I do remember my second grade teacher being Mrs. Frankie Reed, third grade teacher being Mrs. Clarice Ellis and fourth grade teacher was Mrs. Effie O’Neal. My fifth grade teacher was Mrs.Mabel Powell and my main memory of that year was that I played my first Little League game the last day of school. I played for Bates Insurance Co. team that year and made a shoestring catch in that first game off of a ball hit by Luther Richardson. Think I was more surprised, than anyone else that I caught the ball. Mrs. Scivique (sp) was my sixth grade teacher if I remember right, but can’t remember her first name. Grady Harper was my seventh grade teacher and I think Robert Cespiva was my eighth grade teacher, but not sure of that. 1957 was a year that stood out, since that was the year Hurricane Audrey hit the Pineville area that June. I can remember Jim Gaines of KALB radio giving the latest reports about the hurricane. One memory is that we had no power for three days and my dad went to Jimmie Hoyt’s to buy some dry ice. My most vivid memory of 1957 didn’t take place in Pineville, since my dad and my older brother took a trip to Maine that summer. The trip was an education in itself, as we stopped at tourist stops like Rock City and can remember the signs saying SEE ROCK CITY on the roofs of barns along the way. We also saw many Burma Shave signs on the trip. Stopping at Mount Vernon was one of the highlights, while Washington, D.C. was the place that I remember best. We went inside the Capitol building and saw Congress in action, saw the U.S. Mint making bills and visited the National Archive building. We also visited the White House, Lincoln Memorial and the Washington Monument. The Smithsonian Institution was particularly interesting, where we saw the Spirit of St. Louis hanging from the ceiling. The last place I remember seeing was the Library of Congress. Having been an avid baseball fan it was a thrill to see a major league game in Connie Mack Stadium, which was my first game to ever see. Saw future Hall of Famers like Roberto Clemente and Richie Ashburn in the game that, plus another Hall of Famer Bill Mazeroski hit a home run that landed on tin roof above us in left field bleachers. We also went to the planetarium in the Franklin Institute in Philadelphia and saw the Liberty Bell. New York City was a place I will never forget and have not been there in the last 56 years. The main thing I can remember is seeing drunks lying on sidewalk in the Bowery District. That is something a 12 year-old kid always remembers. We drove on to Beverly, Massachusetts, which was our next destination, since my Dad was there for the American Chemical Society convention there. I remember stopping at a Howard Johnson’s Restaurant with the famous orange roof and was impressed that they had 31 flavors of ice cream. While in the area we were able to see the House of Seven Gables and Cape Cod. The convention dealt with such topics as radiocarbon dating of trees and many other topics, that a 12 year-old would never comprehend. Then we went on to Maine to see my Uncle John for the first time and I think the only time. It would be the only time to see my Maine relatives, since my cousin Jim would die in Vietnam in the 60’s, while piloting a helicopter and was shot down. We stopped in Millville, New Jersey to pick up my Dad’s mom and while there saw my Grandpa Godfrey for the first and only time, while he was in the hospital. That reminds me of the times pranksters would call his grocery store and ask if he had Prince Albert in cans and then when he said yes, they would say then let him out. The first and only stop on the way back home was Warsaw, Kentucky and Dad drove almost non-stop from there to Pineville, since school started the same day we got back home. I don’t remember this but my mom told me I had gotten out of the A&P Grocery store at the age of three and walked down to the Murray Street Bridge. George Huffman a Pineville policeman, according to my mom said when he took me off the bridge that he was going to put me in jail, if it ever happened again. I probably didn’t even know what a jail was at that time, since we wouldn’t even have a television till six years later. We didn’t have a television till I was about 9 years old and the only reason we got one was because, of my sister’s eye doctor prescribed it for her, so she could use both eyes and we had a polaroid screen on one side to make her use her “lazy” eye. Being on Cactus Jack with Jack McCall hosting the show on KALB TV was one of my memories from this period and being in the Cub Scouts was another and I can remember riding in the Alexandria Christmas Parade one year. George Huffman was part of another memory, when we thought our cat may have had rabies, so he tried to shoot at it with a shotgun under the house, but missed and the cat lived happily ever after. My folks liked to go to Berwick’s Drug Store in downtown Pineville. The dilapidated building was not like Walgreen’s stores of today, but they must have had good prices on prescriptions. One night we were playing a Little League game at Sandy Canyon, when I heard someone say “That plane’s going to crash” and we could see the plane heading downward and it landed near the Memorial Cemetery for veterans about a block from Main Street in downtown Pineville. Will never forget riding the mile from home to the fire that night. News traveled fast back then, even without any media coverage to speak of. Will never forget Larry McHale of KALB TV, who was ordinarily a newsman, but was advertising the virtues of a certain brand of cigarettes. Then in the middle of the commercial he starts coughing and thinking fast said “Just the thinking of those other brands makes me cough”. One memory that stands out is when a motorcyclist ran across the Red River on a some kind of contraption, that enabled him to ride a motorcycle. Anyone there that day is welcome to give their version of what happened that day. Think we were living on Lawrence Boulevard, when College Drive Baptist Church was founded in 1947. 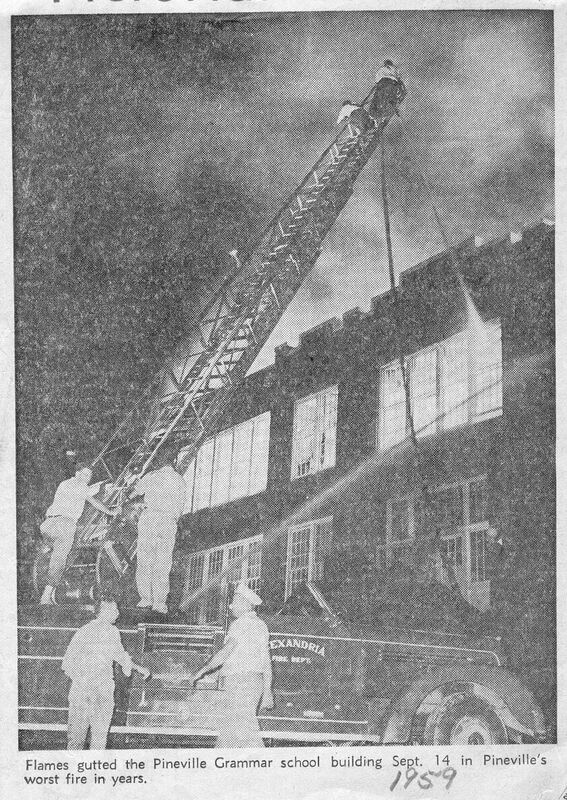 It is now 66 years old and was located close to Louisiana College. I can remember J. Taylor Walworth as the founding pastor, when we joined in 1948. He is one of the few people in my life that never changed and looked the same shortly before his death many years later. Can remember when Harvey McGraw was the education superintendent and a Sunday, which had 237 people present in Sunday School. It was a different time back then when fewer Louisiana College students had their own car, so they naturally walked to the church, which was closest to the college. As the years went by and more students had their own vehicles attendance started to fall. Students then could drive to the bigger churches in Alexandria and Pineville. It was a huge change going from elementary school to high school and it took time to get used to moving from class to class all day at Pineville High. Went to summer school for three years, but graduated from Pineville High in September of 1962. The highlight of my high school years was when the Pineville High Rebels won the state football championship in 1960. Coach Jimmy Keeth and assistant Coach Vernon Beall led the team to a year, that the coaches and players will never forget. I think Coach Gene Millet was also a coach that year, but not positive. There has not been another championship football team from Pineville High School in the last 53 years making that year even more special. I joined the United States Army Reserve in 1962 and went to Fort Polk, Louisiana for basic training. Finished basic shortly before Christmas, then about two weeks later boarded a train at the Missouri Pacific station for Indianapolis,Indiana and headed for the brutal Indian winter, with snow on the ground in Indianapolis, when I arrived in January of 1963. Returned home again from the Adjutant General School in Indianapolis in April of 1963. It didn’t take long to get tired of going to Army Reserve meetings, so joined the Regular Army for a three year enlistment in May of 1963 and would only come home in October of 1964 and 1965, before being honorably discharged in May of 1966 after a tour of duty in Hawaii and Vietnam. It was later in 1966, when I would be employed by the Alexandria Daily Town Talk, not having any idea that I would be working there for 36 years with two years working for the Monroe Morning World from 1974-1976 leaving Town Talk for an $8 a week raise, but Monroe paper had me working so much overtime, that I earned $5,000 more than I had earned with Town Talk the year before. Elvis Presley, indirectly helped me get the job in Monroe. We were in Monroe to see Elvis Presley and happened to drive by the newspaper and I wound up mailing in a job application, which was accepted. I remember we didn’t worry about how hot it was, because we didn’t know what air conditioning was and didn’t have one till the late 60’s. We only had one television station the first few years, before Alpine Cable came to town. We would go out Highway 28 on our bicycles, since there was not much traffic. Nowadays it would be foolish to try to ride a bike on that same road today. I can remember the Star Theater on Main Street catching on fire and Chief Crazy Horse and Dr. Jekyll and Mr. Hyde were on the marquee that day. Think it was still in the 60’s when Louisiana College ended their football program, due to lack of attendance at the games. I can remember the names of some players from back then like Clayton and Harry Bullard, Bill Mount, David Corley, Harry Ingalls, Frank Mobley, Gene Southern, Jim Jossick and Moose Munyan and of course Hamburger Harrison. I remember George Huffman and Gus Perry from the Pineville Police Department and for some reason those are the only names I can recall. Will never forget T.C. Brister who owned a sporting goods store letting me pay $6 for a $6.50 Nokona baseball glove, because that was all the money I had with me. Can remember going to the display window of Jimmy Walker’s Appliance to watch television at night. I can remember visiting neighbors who had a television, which only got a New Orleans station and the picture was mostly snow, but a better picture would appear from time to time. Trips to A&W Root Beer stand in Alexandria were a special treat. Those frosty mugs filled with root beer always hit the spot. It is good to know that the same Martin Library we used to go to in the 50’s and 60’s is still operating many years later. Remember well walking to Jack’s to buy the Sporting News baseball newspaper for a quarter on way home from high school. Can remember the KALB radio record hops with the Big Bopper appearing a year or two before his death in a plane crash,which also killed Buddy Holly in Iowa. Who can forget Mr. Pendergrast walking down the street with his top hat? There were rumors that he was rich, but not sure if he was or not. He sure didn’t live like a rich man. Hope this article revives memories of what it was like growing up in Pineville in the 50’s and 60’s. The FBI has released videos of two suspects, that may have participated in the Boston Marathon bombing earlier this week. The agency is seeking help from citizens, that may have seen the suspects and anything that they may recall about the two individuals. It is imperative that these two suspects be captured, as soon as possible to prevent them from leaving the country, if they are international terrorists or go into hiding if they are American citizens. We should know more about these suspects, now that those there at the Boston Marathon may remember them and may have even have their photos in their cell phones. The main thing is to get these people off the street, so they can be brought to justice, if they are the perpetrators behind the Boston Marathon bombings.